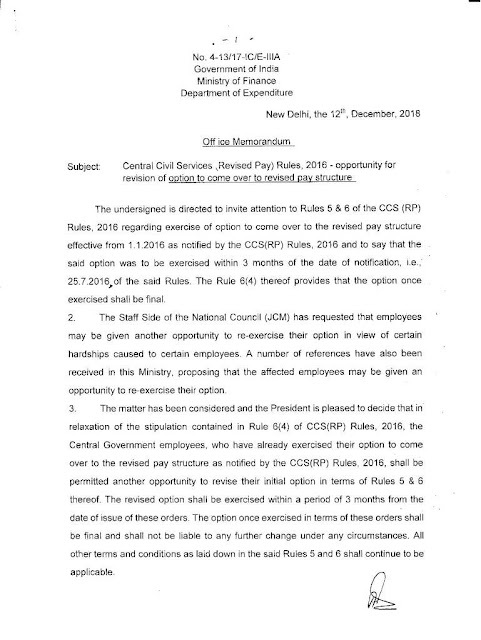 The undersigned is directed to invite attention to Rules 5 & 6 of the CCS (RP) Rules, 2016 regarding exercise of option to come over to the revised pay structure effective from 1.1.2016 as notified by the CCS(RP) Rules, 2016 and to say that the said option was to be exercised within 3 months of the date of notification, i.e. 25.7.2016 of the said Rules. The Rule 6(4) thereof provides that the option once exercised shall be final. 4. 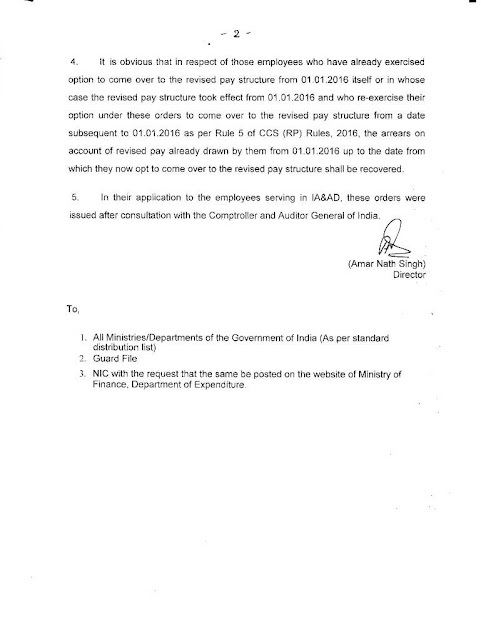 It is obvious that in respect of those employees who have already exercised option to come over to the revised pay structure from 01.01.2016 itself or in whose case the revised pay structure took effect from 01.01.2016 and who ire-exercise their option under these orders to come over to the revised pay structure from a date subsequent to 01.01.2016 as per Rule 5 of 008 (RP) Rules, 2016, the arrears on account of revised pay already drawn by them from 01.01.2016 up to the date from which they now Opt to come over to the revised pay structure shall be recovered. 3. NIC with the request that the same be posted on the website of Ministry of Finance, Department of Expenditure.